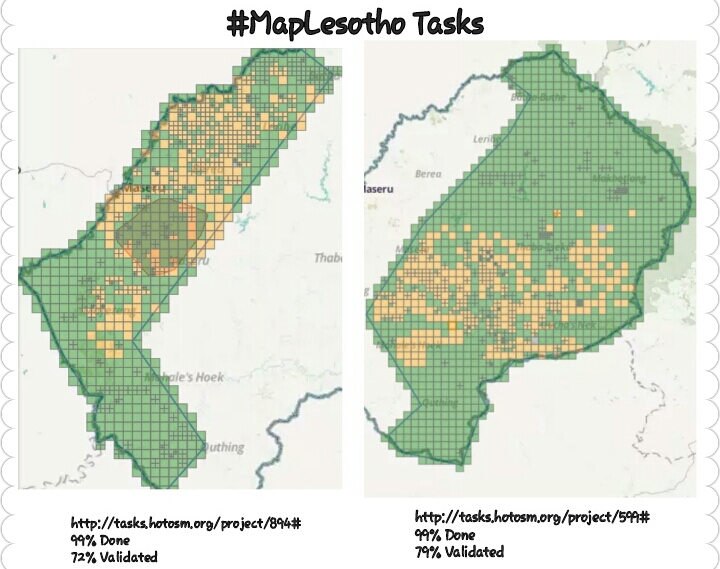 We are now left with two rural tasks in #MapLesotho, which are both 99% done, and above 70% validated. The task that is being pushed hard recently is Rural Task 1 with most APPs working on the districts in which they are based. This task was on 56% validated about 3-4 weeks ago, and now we are on 79%. DeBigC made an observation and he says, “Based on the speed we are doing if everyone does a tile a day, we can say the basemap would be finished by June”. On both tasks, the south is green, with Quthing done and validated. Qacha’s Nek, Mohale’s Hoek, Mafeteng, Maseru and Thaba-Tseka still need a lot of validation as there are more gold tiles. The North is green as well because of @bdiscoe who has been steadily validating it with Butha-Buthe, Leribe and Berea completed in #599 and Mokhotlong to be completed in a few days. In Rural Task 2 on the other hand the north has more gold tiles, but most areas were in urban 2, which is done, and mapping there might be faster.